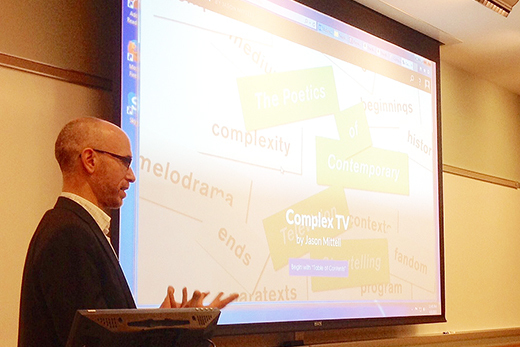 Eric Zinner, associate director and editor-in-chief at NYU Press, discussed the shifting landscape of digital media and its implications for scholarly writing during Meet the Editor and Agent, a recent event hosted by the Center for Faculty Development and Excellence. Center for Faculty Development and Excellence. Habits developed in the familiar and circumscribed territory of academic publishing often hinder academics who are seeking to branch into trade publishing and the wider audience it offers for their work. "A lot of the issue is unlearning bad habits that aren't going to serve you very well when you're not talking to your peers," said Sam Stoloff, senior agent and vice president and principal at the Frances Goldin Literary Agency in New York. Among these habits are a reluctance to write in the first person and favoring analytical rather than emotional hooks to get their points across. Stoloff spoke recently at Meet the Editor and Agent, an annual Emory event that brings experts in publishing to campus. He was joined by Eric Zinner, associate director and editor-in-chief at NYU Press. The event is sponsored by the Center for Faculty Development and Excellence. Identify your intended audience and why your work will appeal to them. Agents and editors want to know who is going to buy your book and why they should, he said. Stating simply that your work is meant for the "general reader" is a nonstarter, because the term is too vague. Just because your subject is "important" doesn't mean anyone will want to read about it. "Buying a book is a very steep hurdle, especially because there's so much competition for people's attention," Stoloff said. Motivate potential readers through emotion. Academics tend to shy away from emotional appeals, said Stoloff, but they are crucial for selling books. Allow for a reasonable amount of exaggeration when packaging book ideas. A book description that includes, for example, the phrase "the debate that defined America" may make an academic wince, but it gets attention — and sales. Definitive, big-picture pronouncements draw readers in, Stoloff said. You don't have to sacrifice academic rigor and accuracy when writing for a non-academic audience. "It can still be a very smart book, it just has to appeal through other, emotional channels," Stoloff said. Stoloff also emphasized the importance of narrative. "Don't lose sight of the power of stories," he said. "Readers want to hear about real people in real situations. It's hard to overstate the power of narrative as a way of engaging the reader." Zinner turned the focus on the shifting landscape of digital media and its implications for scholarly writing. The building blocks of scholarship in the sciences have migrated almost entirely to digital formats, and scholarship in the humanities and social sciences is tilting heavily in the same direction. "If a work or an object is not discoverable online, it is effectively nonexistent," Zinner noted. The enhanced book, which is a digital book that contains embedded audio and video files. "It's no longer just the print book. The text is the same, but the added resources make the experience of reading different," Zinner said. Books published on websites that allow readers to interact with the writer, and even to suggest revisions. Books available to read only online. In addition to being available in traditional hard copy, the book is also available on a website designed specifically to make reading and navigation easy. Zinner compared the platform to books on a Kindle, but which can be accessed only with an internet connection. "What university presses need and what we're thinking about are technologies that are scalable and reproducible," Zinner concluded, "and scholars need to forcefully take on the role of stewards and agents of their own work, now more than ever … when the timing and nature of what constitutes publishing is shifting dramatically."